Seasoned Detective Seo Do-cheol served as a technical advisor to a TV cop show, but he is not about to go Hollywood. Frankly, he is too undisciplined for any sort of corruption. While he is no end of headaches for his frustrated wife and task force leader, he is the last cop any bad guy would want on his case. 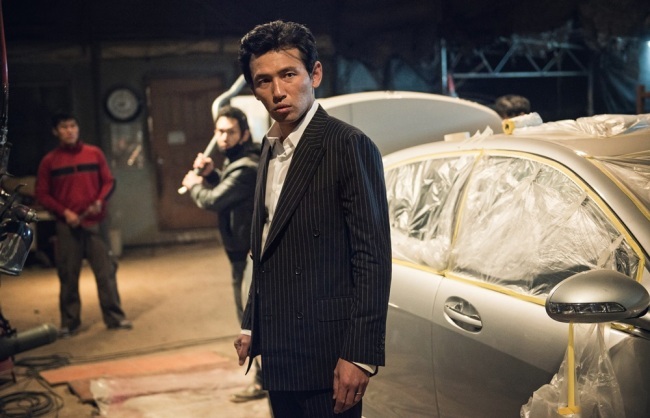 A coked-up sadistic corporate heir will learn that the hard way when he messes with a friendly acquaintance of Seo’s (Hell yes, that’s all it takes) in Ryoo Seung-wan’s Veteran (trailer here), which opens this Friday in New York, after laying a smackdown on this year’s TIFF. After busting a high-end car theft ring Det. Seo and team leader Oh are poised for national promotion. Of course, the car thieves did not give up without a fight, but that was A-OK with Seo. If he can keep quiet for next month or so, he’ll be moving on up. Unfortunately, he meets the reprehensible Jo Tae-oh at a party for the TV show he basically lent his name to. Watching his abusive behavior towards women rubs the cop the wrong way. When he subsequently learns the truck driver he contracted during the stolen car sting tried to commit suicide at the Sunjin Group, Jo’s perennially under-investigation conglomerate, Seo launches a personal investigation. Apparently, Bae Cheol-ho and his driver colleagues were fired by a Sunjin holding company for joining a union. Since said union is nowhere to be seen, it is safe to say Bae’s dues were not well spent. Regardless, when Bae crashes the corporate office seeking the wages owed him, Jo humiliates him, forcing him to box the thuggish manager Jeon, who pink-slipped him. Needless to say, the bout does not go well for Bae. In fact, he throws himself down the Sunjin stairwell, ending up in a coma rather than the morgue. Unfortunately, the case is not in Seo’s jurisdiction, but he is not about to let bureaucratic niceties dissuade him. Jo and his chief fixer, VP Choi Dae-ung play hardball, but they keep misunderestimating Seo’s obstinate tenacity. Despite the somewhat clichéd class warfare themes (seriously, whatever happened to that disappearing union? 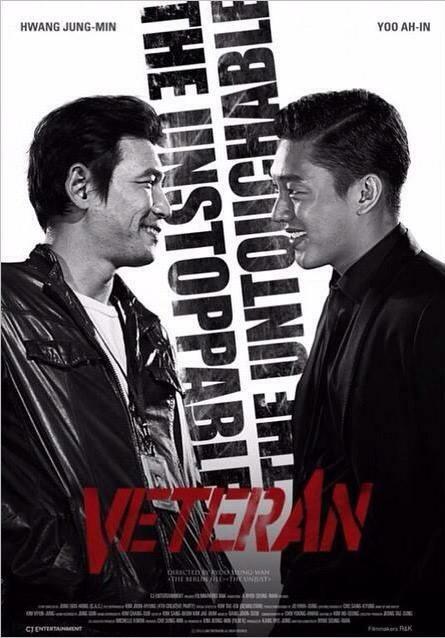 ), Veteran is a rock’em sock’em action film that benefits from its comparatively narrow scope and proletarian sensibility. Seo and Jo just really, really do not like each other. That builds mucho anticipation for their climatic face-off, which pays off nicely. Hwang Jung-min is perfect as the rough-edged, slightly eccentric Seo, taking the maverick cop to a whole new level of unruliness. Yoo Ah-in is just okay as Jo, a standard issue villain whose likes we have often seen before, but Yu Hae-jin is terrific as his calculating right-hand Choi. Oh Dal-su largely keeps the shtick in check as the put-upon team leader, but Jin Kyung (his co-star in the even more awesome Assassination) really makes an impression in her brief but meaningful appearances as Seo’s less-than-amused wife Joo-yeon. Rather inexplicably, Ma Dong-seok (a.k.a. Don Lee) also has a fleeting cameo as a stationary store owner, but he’s still pretty cool. Although Veteran is not as smart and stylish as Ryoo’s The Berlin File, he still delivers plenty of satisfying action. Its grunginess and contempt for authority are both good things. Recommended for fans of hardnose cop movies, Veteran opens this Friday (9/18) in New York, at the AMC Empire.